Creates two 9/32” holes. Operating instructions located directly on punch base. 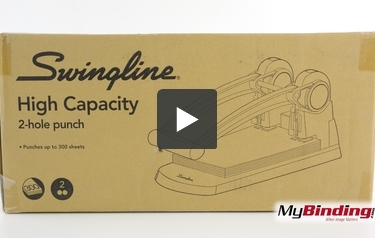 Dimensions: 17.0" x 7.0625" x 7.75"
Welcome to MyBinding Video. This is the Extra High Capacity 2-Hole Punch from Swingline. With a total punching capacity of 300 pages, this heavy duty cutting tool will not disappoint. It’s very simple to use, but if anyone needs, detailed instructions are printed right onto the base. The only setup required is to snap on the waste tray on the back side. On the left side, there is a paper guide that extends out and has handy notches for standard sizes of paper. They were even clever enough to put markings to show how much paper you’re trying to punch. I am punching the maximum 300 sheets of 20lb paper. Depress the handle all the way down until it stops. Then raise the handle until you hear the click, when the handle is roughly straight up. Depress the handle again until it stops to finish punching, then raise the handle all the way back to release the paper. If you need to clear the chips from inside the punch heads, use the red plastic tool located underneath the punch. The Extra High Capacity 2-Hole Punch is easy to use, the handle is comfortable and it doesn’t take super strength to operate. Swingline even offers a 180 day warranty. For more videos and all your binding needs, visit MyBinding.com. Welcome to MyBinding Video. 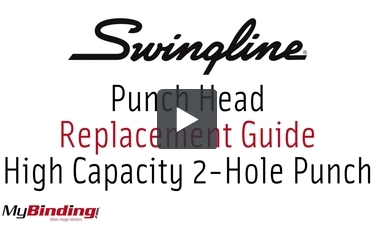 This is the Punch Head Replacement Guide for the Extra High Capacity 2-Hole Punch from Swingline. Included with your punch should be a hex wrench and a plastic punch head clamp. Snap the head clamp around the punch head, this will help you extract it. Use the hex wrench to loosen the bolt securing the head, and it should come down and away. Take your new head, and snap it into the head clamp, and fit it all the way up into the mechanism. Use the hex wrench to tighten the bolt, then you can pull the head clamp off. Now you’re ready to get back to punching. For more videos and all your binding needs, visit MyBinding.com. How far apart are the holes? is this adjustable? The holes are fixed. They are about 2.7 inches apart.